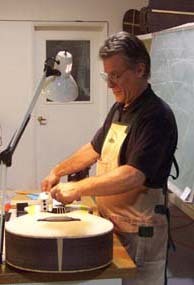 All classes are taught by Charles Fox, see his bio on our ABOUT US page. 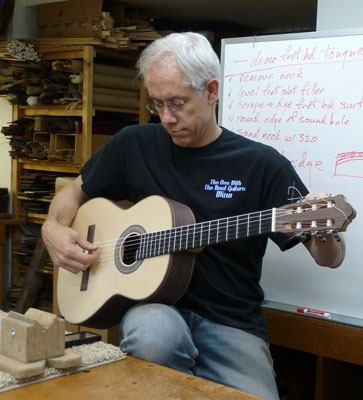 CONTEMPORARY GUITAR MAKING is a window on guitar making's dynamic new reality. Today’s high quality guitar making is based on an accurate grasp of the acoustical behavior of the instrument and a working knowledge of the most effective means of the craft. Armed with these two things, a growing number of world class luthiers are able to systematically optimize important qualities of their guitars, and to build enough of them to both advance steadily in their craft and make a comfortable living. Contemporary Guitar Making invites you to share the understanding and the techniques that make this possible. CONTEMPORARY GUITAR MAKING is a comprehensive five-day survey of the craft as it is practiced today. This lecture/demonstration seminar's study topics range from nuts-and-bolts skills to fundamental theory and principles, with an emphasis always on their direct application to state-of-the-art guitar making. Every aspect of the guitar's function, design and construction - both steel string and classical - is demonstrated on actual work in progress and explained in detail. Contemporary Guitar Making examines the guitar's acoustical, structural, and aesthetic design factors as well as materials, construction methods, voicing, tooling, shop design, marketing, and other topics critical to the practice of lutherie in today's world. 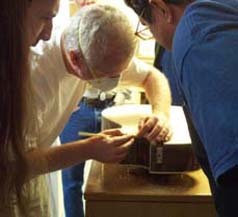 For the beginning guitar maker, this unique seminar is the best possible introduction to the field - a strong foundation for working ultimately at an accomplished professional level. This course will take years off your learning curve by starting you off right at the top, ready to work with a clear awareness of the state of the art. Although it's not required, some familiarity with tools and materials is useful, as this program is not a general introduction to the art and craft of woodworking. 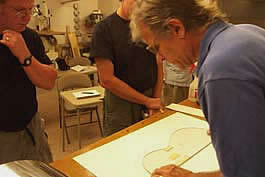 For the more experienced guitar maker, this seminar will dramatically broaden your frame of reference. It is an opportunity to review your own approach to the craft in a new creative light; a chance to further refine the quality and direction of your work and to resolve the guitar building problems that remain for you. For the full-time luthier, this intensive re-examination of the craft will help you both to break out of the old habits that we all get stuck in and to take your work to its next level with renewed inspiration and increased productivity. The information and techniques from this seminar should allow you to measurably increase your output. We'll concentrate throughout on the basic physics that inform the guitar's design. Every important principle is identified, explained, and underscored by demonstrating its direct application. The aim is for you to be guided in your work by a clear understanding of the phenomena that govern the behavior of the instrument. 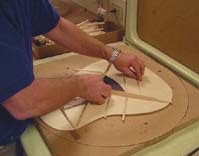 The creation of a guitar begins with design work and pattern making. The logic and thoroughness of this process are rewarded throughout the building of the instrument. You'll learn simple procedures that will produce an integrated design and a complete set of working patterns in just a few hours. The best choice of tools for guitar making depends on your personal style, resources and available space. We'll examine an extremely versatile and compact setup that's perfect for the small guitar-making shop. Well designed jigs and fixtures are a key to efficiency and to consistent high-quality work. 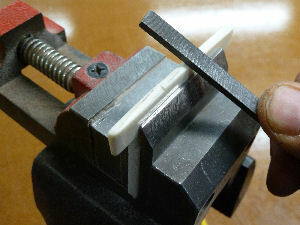 We'll explore the few basic principles around which most jigs and fixtures can be designed and we'll examine many affordable time-saving guitar making devices. Working efficiently is important to anyone who values his or her time. There's more than one way to set up an efficient workshop, but there's only one best way for you to do it without compromising either the quality of your work or your enjoyment of it. We'll discuss tooling up and organizing the one-person shop for smooth productivity, with an emphasis on economy and appropriate means. Fundamentally, there are two basic ways to build guitars: free-form on an open work board, for prototyping and other custom work, and fixed-form, using solid molds and other specialized devices, for efficiently reproducing your standardized designs. Familiarity with both ways is essential for creative, efficient lutherie. We'll examine a variety of approaches to every construction process, from traditional hand methods to up-to-date time-saving production techniques. You'll learn ways of guitar building designed to maximize the quality of your work while minimizing your time and effort. All of these methods are presented in the context of a logical, integrated approach to the craft. 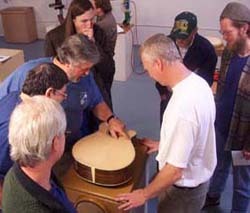 Class format: Each student creates his or her own instrument as each step is discussed and demonstrated. Enrollment is limited to four students. We work long hours, Monday through Saturday each of 2 weeks (one week for electric guitar or bass making). 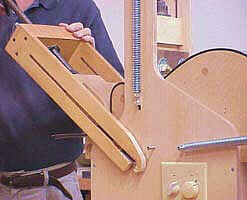 Some lutherie or woodworking experience is a plus, but not required. Please email with any questions, or call to speak with us personally. The craft of guitar of making is a rich collection of methods, techniques and skills that can take a lifetime to acquire and refine on one's own. 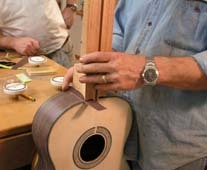 Because few of us have a lifetime to put it all together, ASL offers this unique two-week opportunity to construct a fine quality guitar while learning the guitar making methods used by today's most creative and successful luthiers. HANDS-ON GUITAR MAKING provides the perfect setting and means to do your best possible work and learning, whether you're a guitar-making novice or a seasoned luthier. 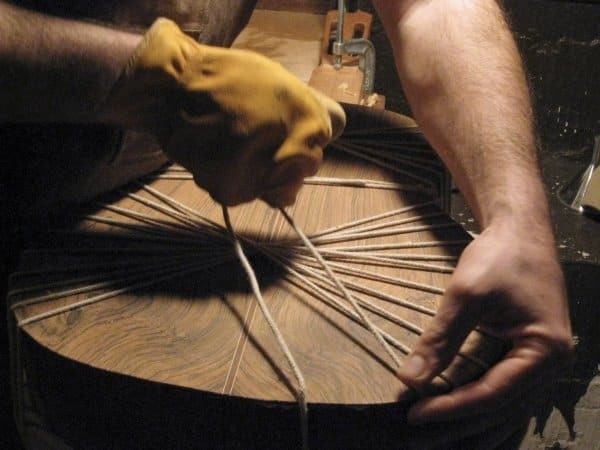 You'll learn a logical, integrated approach to the craft - a synthesis of today's most effective practices and techniques - some as old as forever and some as new as tomorrow. These methods are key to optimizing the quality, efficiency and creativity of your work. They're the logical place to start as a beginning luthier and they're essential for achieving today's extremely high standards of excellence. 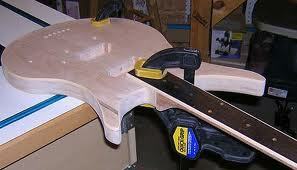 You'll learn how to build a guitar of any size and shape without fixed molds and other specialized forms. Working from the raw materials, you'll create the parts, construct the sub-assemblies, assemble, shape, trim, sand, seal, set up and finally play your guitar, learning each phase of the process in turn, in real time at your workbench. The hands-on class experience is designed to prepare you for steady advancement in your continued self-learning. You'll select from among several body styles, such as the OO, OM, Small Jumbo, Dreadnaught, etc, which cover the range of today's most popular models. While its bracing pattern will remain true to CF Martin's brilliant X-brace design, modern design elements such as narrow neck profile, compound radius fingerboards, rigid rims, and removable necks bring this traditional instrument into the present and optimized for today's fingerstyle emphasis. Making a guitar here means nothing if you can't do it again on your own. Your work space at ASL is a model of compact efficiency which is designed, along with the time-saving jigs and fixtures that you'll use here, to be easily reproduced by you at home. You'll return home with a clear understanding of both what's needed to build your next guitar and how to do it. Format: This is an intensive hands-on workshop, designed for guitar owners, guitar techs, guitar dealers and budding luthiers. 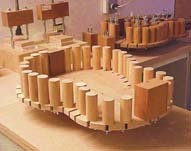 Previous lutherie or wood-working experience is useful but not required. Some past hands-on experience though is recommended. SETUP, MAINTENANCE & BASIC REPAIR is your introduction to the skills and techniques used by professional guitar techs and repair persons to keep guitars in good condition and playing at their best. You'll learn how to trouble-shoot instruments and do what's needed to optimize their performance (Setup), how to keep them in excellent over-all condition (Maintenance), and how to correct the most common problems that full-time repair persons deal with (Repair). You'll learn to do professional quality fret work, to fine-tune string action and intonation, make nuts and saddles, clean and replace controls and pickups, fix dents and scratches, re-set loose bridges and braces, repair broken pegheads, and much more. Most of what you now depend on others to do, to correct problems that develop and to keep your guitars looking and playing at their best, are really quite easy to do yourself once you know how. If you own one or more guitars that really matter to you, consider the satisfaction and the practical value of caring for them yourself. No one cares as much as you do for their ultimate well-being, and no one knows better than you when your instrument is playing at its ultimate best. Only you can fine-tune your setup in real time, as you play, until it's absolutely perfect for you. Players write checks for what makes them a better player. 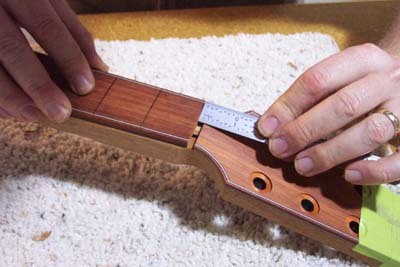 So, learn to do a fret job that far exceeds commercial standards - one that actually extends a player's musical reach. Deliver that fret job with an excellent setup, at an affordable price, and you could be in business based on that alone. Add to that the routine maintenance sevices that every guitar needs, do them well, and players (guitar shops too) might very well be writing those checks to you. If you're already a guitar tech, why not become one of the best and write your own ticket? Doing work at a level that sets new standards should do the trick. We'll show you what that looks like and how to do it. Every guitar store needs to setup and maintain both the instruments in the shop and those of its customers; but not every guitar store can support a full time in-house service person. One solution to this problem is for you, the proprietor, to learn the necessary skills and personally provide these important services. Another solution is to provide training for an employee who will do the work, or who is already doing so without the benefit of formal training. It takes time for new luthiers to learn to produce guitars of the consistently high quality required in today's very competitive market. While you're refining your guitar making skills you can become active in the field early on by providing your musical community with the setup, maintenance & basic repair services that all guitar players need. When you're ready to introduce your own hand-made instruments, your reputation, connections, and customer base will be invaluable - plus, the design of your instruments will reflect a deeper understanding of what guitar players really need and value. Learn to create the most perfect playability and intonation on any guitar by adjusting neck, frets, strings, nut & saddle expertly. Learn to level and buff lacquer and other finishes; clean and replace tuning machines, nuts, saddles, pickups, etc; do a partial or complete fret job, upgrade bridge pins, strap buttons, output jacks, etc; and everything else that needs doing. Learn to fill and spot-finish dents and other surface injuries; re-glue loose braces, bridges and pickguards; remove and replace cracked bridges and bridge plates and repair broken pegheads. While it most certainly goes without saying, let's just say it for the benefit of any dreamers: considerable committment and practice is required to master the skills and techniques you'll learn in Setup, Maintenance & Basic Repair. This relatively brief, intensive workshop is designed to minimize your learning curve by setting you in the right direction on your path toward achieving professional quality work through your own continued self-learning. Class format: You'll be introduced to the most frequently encountered guitar repairs and you'll learn to do them yourself on real guitars. This intensive hands-on workshop is designed for anyone who imagines his/her self eventually doing this work professionally. Previous lutherie or wood-working experience is not required but some previous use of tools and materials is strongly recommended. 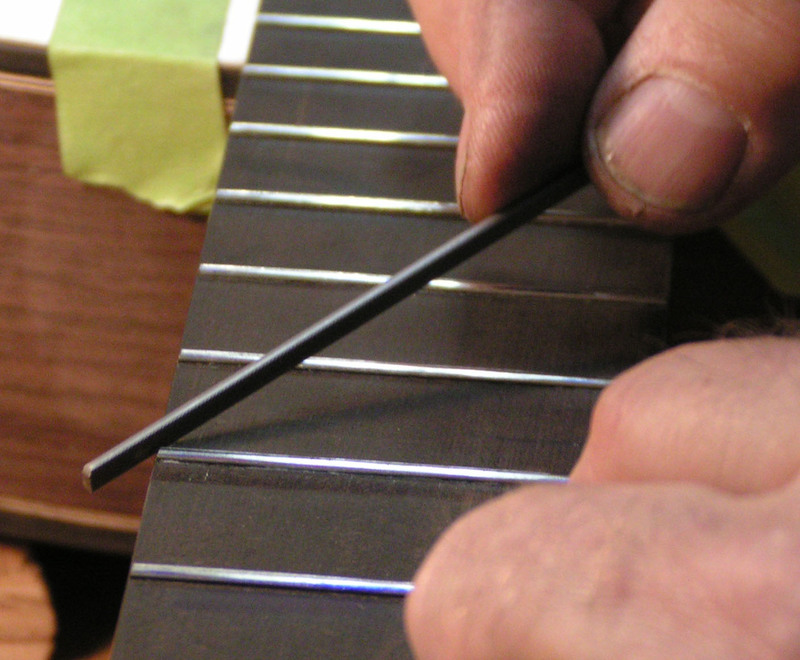 GUITAR REPAIR is an area of lutherie that gets less attention and glory than guitar making. Many of today's prominent guitar makers though, began their work in lutherie by doing guitar repairs and they credit that work for their deep understanding of the structural refinement of their hand made instruments. 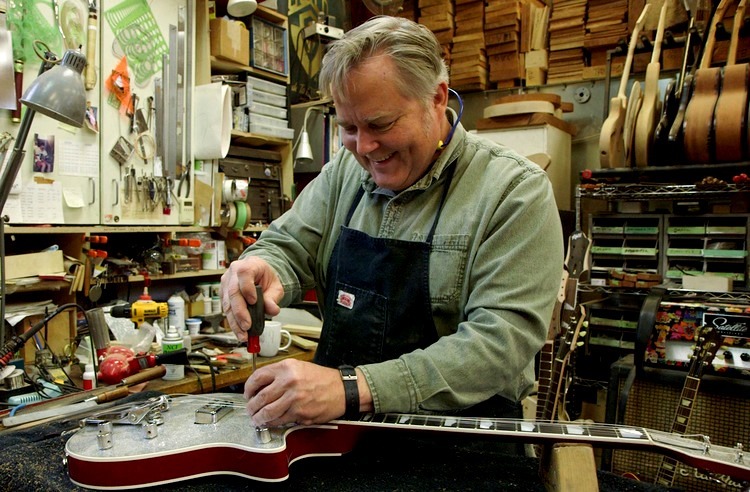 A good number of guitar makers create a nicely balanced work life by doing repairs as well. Repair work is an excellent way to develop one's skills at the work bench, and it's a solid income source. 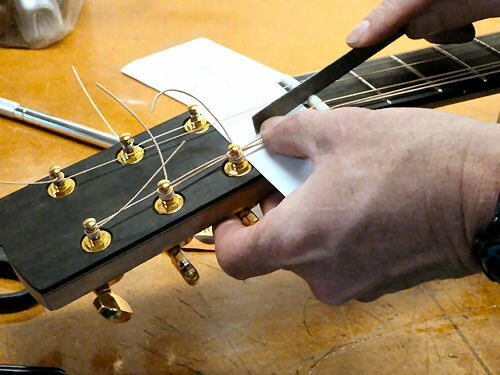 is an introduction to the skills and techniques used by professional repair persons to fix or adjust broken, injured, and otherwise compromised acoustic and electric guitars. 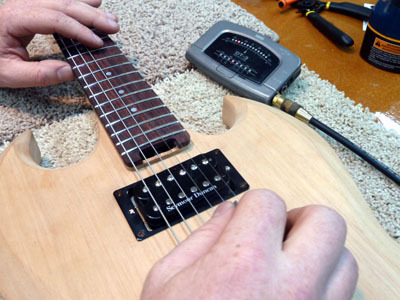 You'll learn how to correct the most common problems that professional repair persons deal with and you'll learn how to setup a repaired instrument to play better than ever. It's no good learning techniques that have been simplified for beginners. You want to learn how to do things the way professionals do them. 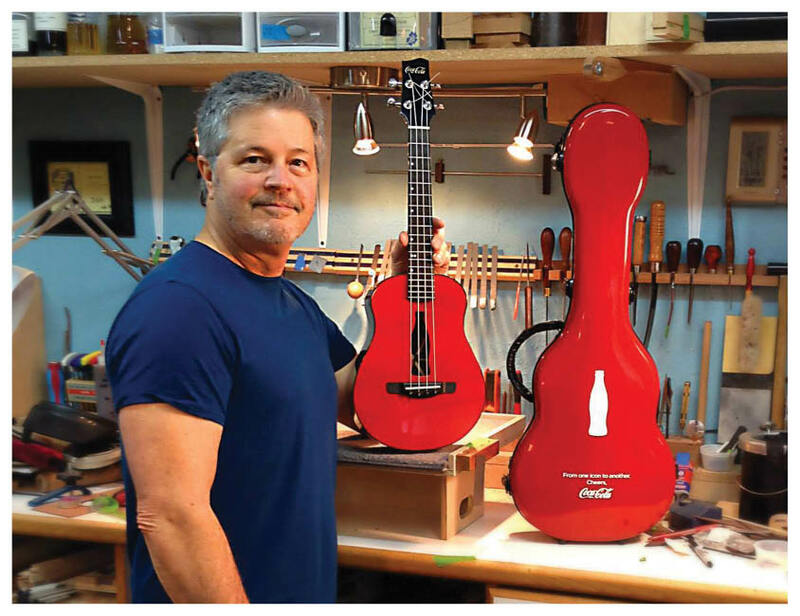 Head instructor Kerry Char has been repairing and restoring stringed instruments for over 25 years while also building highly sought after acoustic guitars and ukuleles. He's as experienced a professional as you could ever hope to learn from. Kerry has been teaching the repairs section of ASL's Setup, Maintenance and Basic Repair class for years and he's a source of endless pro tips that you'll find in no books. WHAT REPAIRS WILL I LEARN? We assume that students in this class consider that they might do this work professionally one day. This introduction to professional guitar repair is for you if you have the discipline to practice what you've learned here until your results are routinely successful. Plan to gather a number of 'junkers’ or ‘yard sale specials' to practice on at home without consequence. 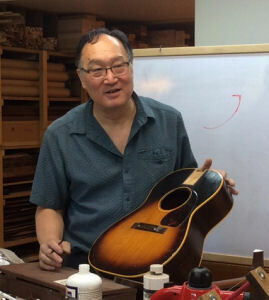 Self-directed learning is part of every professional luthier's development and lifelong refinement. We'll advise you on how to go about refining your repair skills on your own but you must be prepared to become your own best teacher. CAN I WORK ON MY OWN GUITAR? You're welcome to bring along a guitar of your own that needs work, but don't bring an expensive or otherwise precious instrument to do your first work on. If you want to bring a guitar of your own to class, let's plan to discuss it before you leave home. We'll review what you hope to do on the instrument and determine if it's appropriate for your first attempt at it. 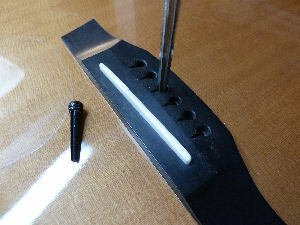 Tuition for Hands-on Guitar Repair includes all materials and supplies, including practice guitars for you to work on. Tools will be provided, no need to bring your own. By the end of class you'll know exactly what tools and equipment you'll need to set up your own efficient workspace at home, and where to get them. 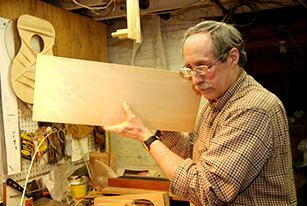 Class Format: Seminar in designing your own best work space, and tours of professional lutherie shops. I can’t guess the number of times I’ve been asked about setting up a shop for lutherie. Everyone who enters the craft needs a place to do the work, and planning that space presents an important set of early decisions for a luthier to make. Or, not to make. 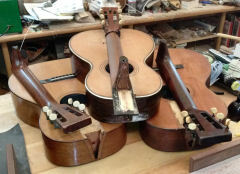 Many early luthiers work in spaces that are not at all the result of conscious design based on thoughtful analysis. For lack of an informed plan, one’s shop can become a surrounding of random disorder in which we struggle to produce our best possible work in spite of our work environment, instead of creating in a space that’s optimized to facilitate our best possible work. Everyone begins this craft reasonably unaware of the full nature of the work. Eventually one has the depth of experience to know exactly what one needs from one’s work space, but why wait for that? Lutherie Shop Design will help you plan the most ideal lutherie shop right now for the space and budget that’s available to you. We’ll brainstorm as a group on the best possibilities for each individual’s needs and resources. 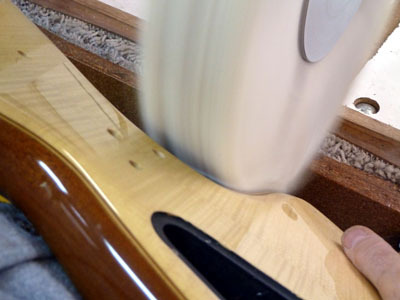 We’ll look at the five departments of lutherie - parts, assembly, trim, finish, and setup – and make sure their particular needs are all covered. We’ll study work patterns that minimize wasted space and energy. We’ll consider how your workshop can develop over time around an original core of basic tools and a simple layout. 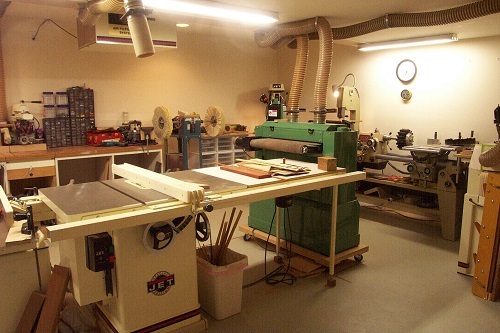 We’ll emphasize ways to maximize the versatility of these basic tools and modest space. I recommend visiting full time luthiers’ shops whenever you have the opportunity. You’re bound to see something there that you wouldn’t otherwise have seen nor thought of on your own. 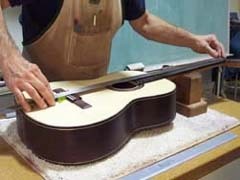 That’s because every professional lutherie shop reflects the unique personal thinking and working styles of its tenant. For inspiration, we've lined up a number of full time professional luthiers who’ll open their shops to us and discuss their work and their work environments, and how that all fits together for them. We'll visit builders Saul Koll (www.kollguitars.com), John Greven (www.grevenguitars.com), Mark Roberts (www.roberts-guitars.com), Kerry Char (www.charguitars.com), David King (www.kingbasses.com), Peter Tsiorba (www.tsiorba.com). If you personally recognize the relevance of this 5-day seminar, and its potential impact on the quality of your work, we hope you’ll take advantage of this opportunity and join us. Occasionally weekend workshops may be added to the teaching schedule. These one and two-day workshops are focused on topics and methods important for the creation of professional, performance-quality guitars.